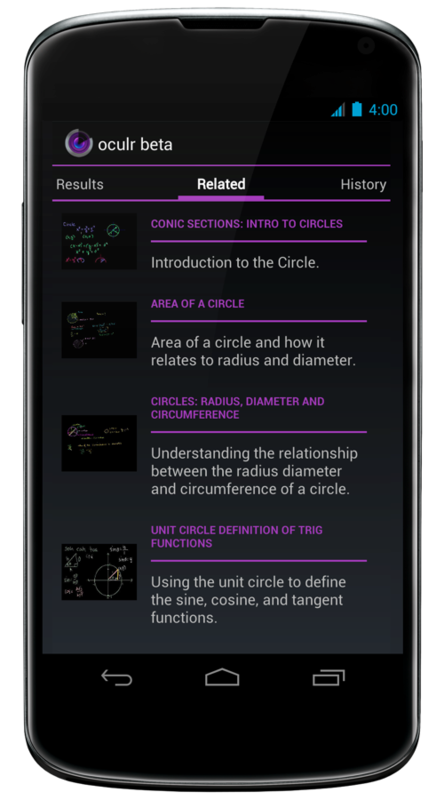 oculr is a one of a kind education app designed to help students learn from diverse resources about specific math or science equations in an intuitive way. Download it from Google Play today. 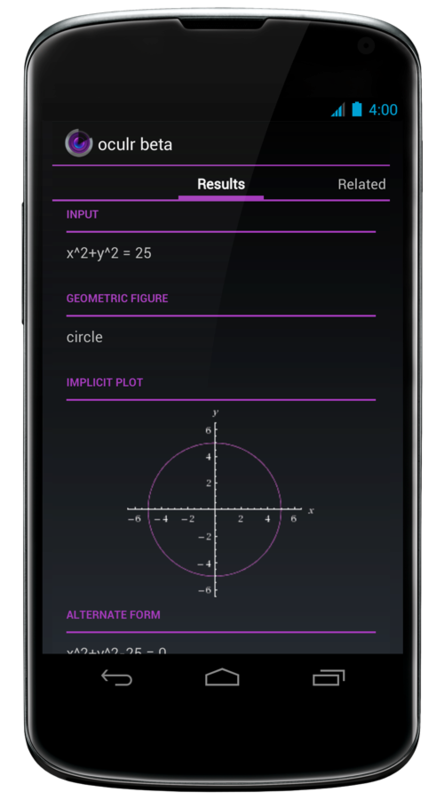 Simply take a picture of an equation, and oculr will scan it, return the solutions, graph it, and give you videos relevant to the subject you want to learn about. You then have the option to export the data to Evernote; complete with the enhanced image, graph, answer, related links, and any notes you'd like to add. We're currently working on our own handwriting recognition to make learning equations more intuitive than ever imaginable. Matt is logical, practical, and social. Although he's been staring at a screen for half of his life, his eyes still work fine and he currently studies computer science at the University of Texas. His role includes implementation of the UI and interfacing with education API's. When he's not busy at the computer, he's either hard at work with his soldering iron and oscilloscope or wandering around Dallas, admiring the city's planning and architecture. Someday, Matt will live in a house of his own design in a quaint Silicon Valley neighborhood. Bilal is a passionate member of the Dallas startup and nonprofit community, and a student at Plano East Senior High School. His eye for design is an invaluable asset to the team. His role includes product design, marketing, branding, and UIX design. Bilal is an avid biker and reads about theoretical physics in his spare time. He proudly shoots film with his grandfather's 1985 Minolta and has a particular obsession with blueberries. Ahmed is multi-faceted and to the point. His impressive work ethic and immense commitment serves as a model for the team to follow. His role as a User Experience designer helps the team consider various feature implementations and workflows, and directly contributes to product refinement. Ahmed would always rather be gaming or flashing custom software on his Galaxy S4. He hopes to acheive his dreams of skydiving with his clothes on. Sarad is keen with business and finance, having particular interest in working with accelerators and investors in Dallas. His entepreneurial initiative leads him to craft interesting projects. His role includes company development, finances, product management, and front-end development. Sarad enjoys spending his idle hours writing short stories and poems, checking on his stock portfolio, and reading Inc Magazine. He dreams of one day having a beach house in Barcelona and you might see him on the cover of Forbes. Trent is outgoing and charismatic, and his willingness to take a challenge fuels the conviction of the team. His role includes designing and developing advanced image-processing algorithms with rigourous efficiency testing and integration with API's. Trent wants a servant named Butler and one day he will most likely live in Mountain View in a house with a chocolate waterfall. 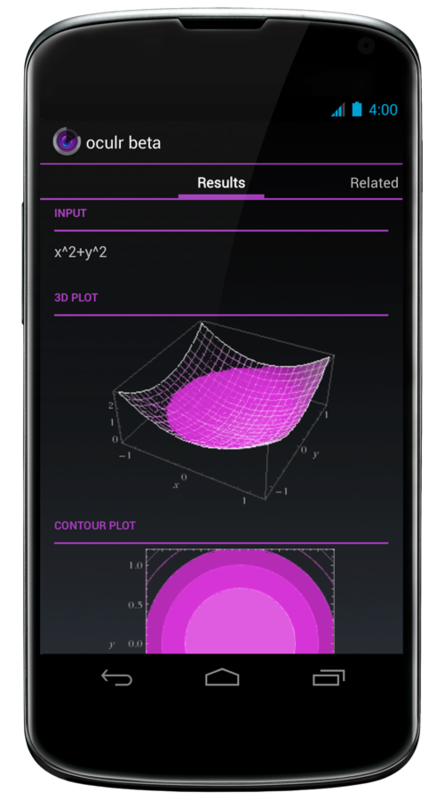 OculrTech is the professional initiative which spawned from a 1st place win at AT&T's Mobile App Hackathon in 2012. After our initial success, oculr received much recognition within the community. An interview with the local Plano Star Courier and a press release on the AT&T Developer network motivated us to continue with the project. We were later privileged with an honourable mention by congressman Sam Johnson and a feature in AT&T's 2013 Annual Report. Feel free to shoot us an email anytime about any questions, comments, or concerns. We'll get back to you as soon as we can.Say hello!